Are you ready for Adventure? 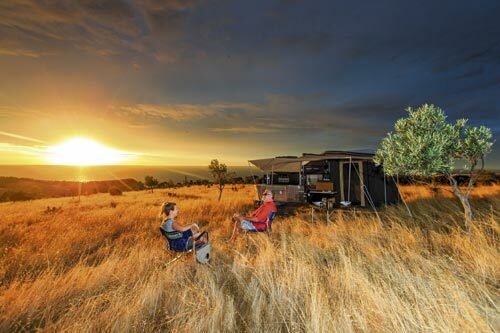 Arkaroola lies in SA’s North Flinders Ranges and many southern state adventurers consider it the gateway to the outback. The Adventure Arkaroola Elite aptly reflects its namesake by providing a staging point to launch your desert sojourn. According to Adventure Offroad Campers, “The best camping spots are usually off the beaten track, a long way from the blacktop, where the crowds fear to tread. 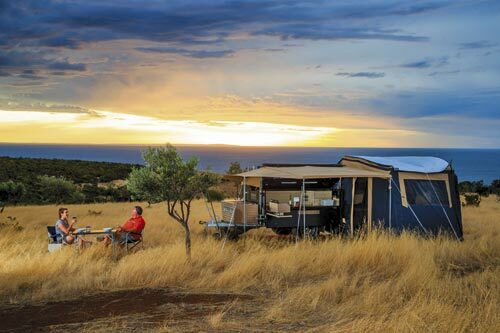 In these remote and beautiful places you can have your cake and eat it too.” Not only can you have your cake, but with the Adventure Arkaroola you can have your tinnie on top, plenty of gear, tonnes of water, a homely tent complete with a king size bed, shade, and all of the comforts of home in a rugged and functional offroad vehicle. I was lucky enough to travel twice with the Arkaroola. My first experience was on a wet, dismal weekend on Victoria’s east coast at a campsite known, funnily enough given my nickname, as Bear Gully. We traipsed up and down sand dunes and over corrugated tracks with the Arkaroola in tow, and had a dry and comfortable campsite in the inclement conditions. A few things bothered me when I first set up and packed up the camper without instruction. 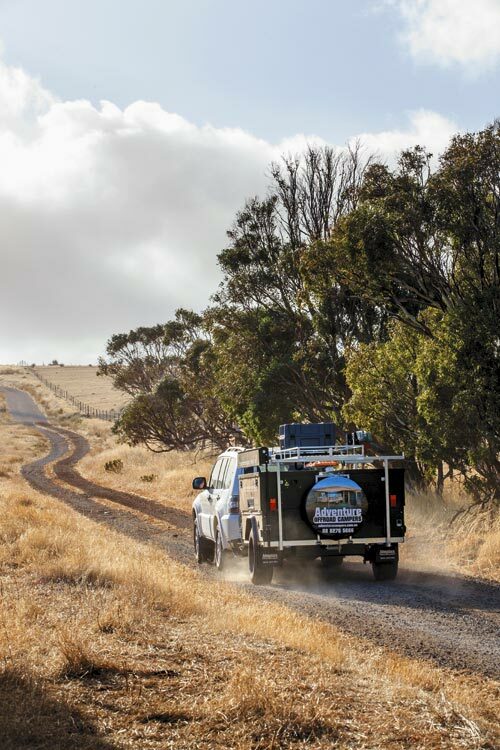 However, before I travelled to the beautiful Fleurieu Peninsula in Adventure’s home state of SA, the manufacturer gave me a thorough rundown on the process. I found it much easier to set it up and pack it down once I knew the correct procedure — who’d have thought? Catering is a dream with the large kitchen, which Adventure claims to be the most accessible on the market. Half of the rooftop pivots up and the side panel folds down, revealing a very functional kitchen complete with fold-out Lido Junior stainless steel two-burner stove and grill, and an additional cooking light for the Elite model. There is a multitude of cutlery, crockery and accessories drawers, pantry storage, a manual and electric water pump, and more bench space than you can shake a chopstick at. There isn’t a sink but the good old plastic dishes bucket does the job just fine, or a stainless steel sink can be installed as an option. 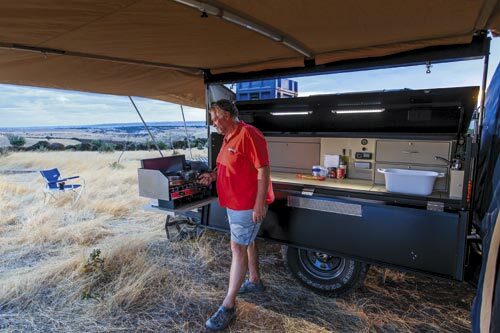 The Arkaroola’s dust-proof doors reveal a 2.3m-long waist-high bench offering outstanding ergonomics when you’re cooking a feast at camp or throwing together a simple roadside meal. 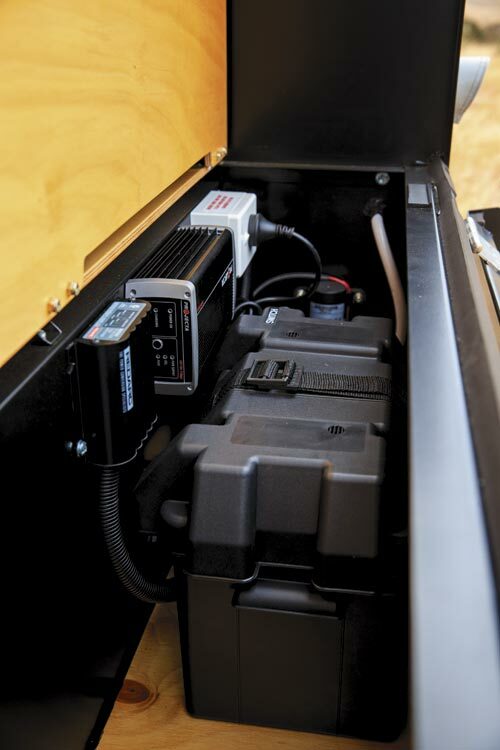 There is a combination of bug-resistant and brilliant LED lighting, plus 12/240V power-points, gauges to monitor water in the 59 and 86L water tanks and power in the 120Ah AGM battery. The new Elite model also has a Fusion sound system with iPod dock. If you need shelter over the kitchen and beyond, simply pull out the retractable awning. Hook and fastener between the awning and main tent provides a waterproof seal once assembled. 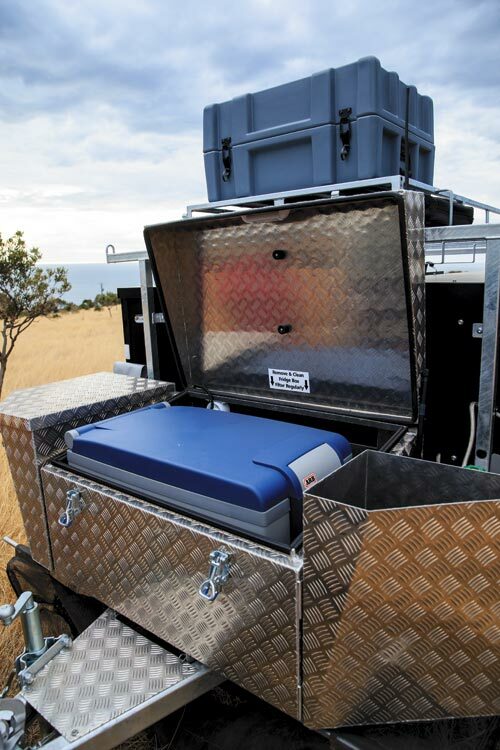 The large 78L ARB fridge/freezer is secured in a tough, checkerplate aluminium box protected by a stoneguard of Adventure’s own design. 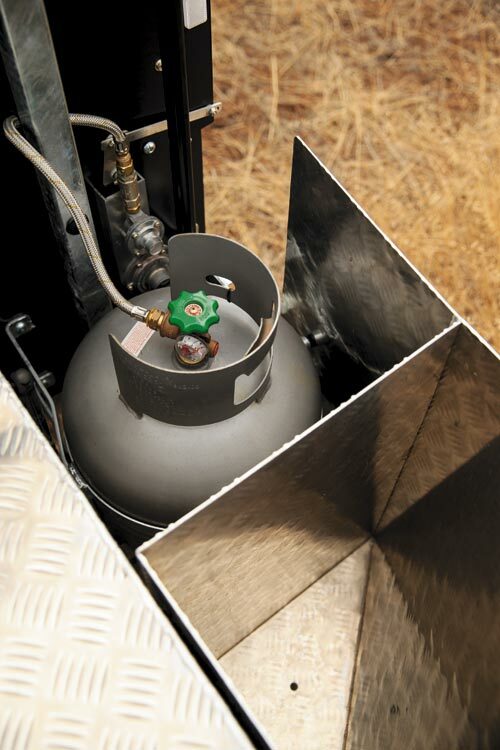 The gas bottle sits conveniently next to the fridge and is easy to replace, thanks to the pivoting door. 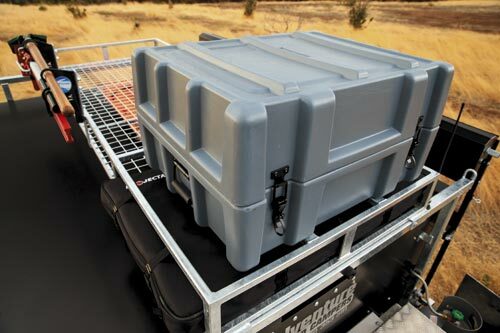 There is a deep, dust-proof storage bucket on the driver’s side, as well as a heavy-duty jockey wheel and Treg hitch out front. Moving around to the driver’s side we find a huge storage area opposite the kitchen. It is big, long and dustproof, saving you digging through awkward hatches. Adventure claims the unit has more waist-level storage than any other camper and I can’t argue with that. 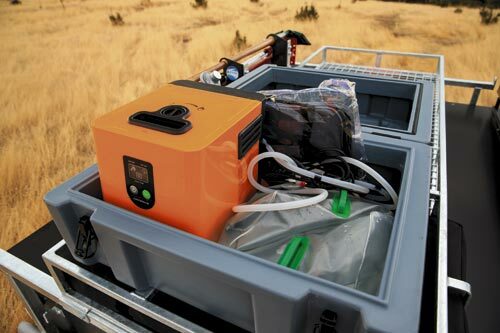 Simply open the top and side doors and there is 2.3x1.1x 0.45m, or a massive 1100L, of dust- and waterproof storage — with LED lighting — in front of you. The bed and tent slides out from the underside rear leaving room for a large storage rack up top suitable for a decent aluminium dinghy — or whatever takes your fancy. 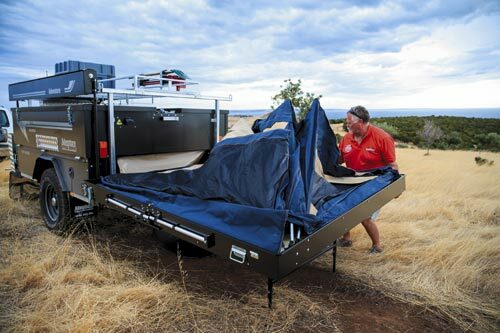 The sliding tent and bed mechanism is unique and takes a couple of attempts to get your head around, but it’s relatively simple once you know how. The new spring-loaded mechanism makes it much easier to fold down the rear bumper/spare wheel mount away from the tailgate. 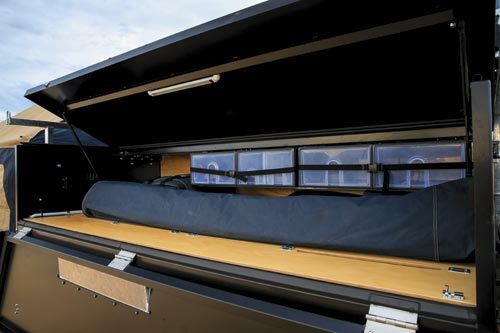 The double-sealed ‘bedcase’ slides out on an extendable frame, pivots 90° and locks in place ready for you to open. The tent cantilevers to the passenger side, but is quite heavy and needs two people to make life easy. 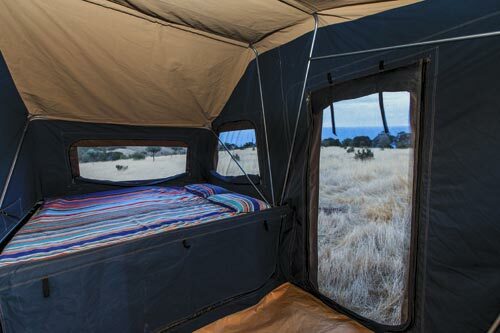 Securing the internal tent frame and sliding bed supports reveals the 2150x2300mm tent and huge king-size bed. 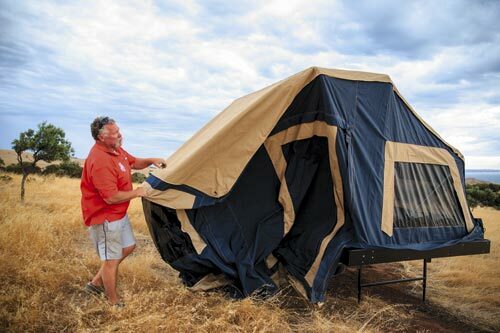 The canvas quality is very good and the tent comes with two doorways, four big windows and fine screen mesh to keep out the insects. Extra rooms are available as an option. 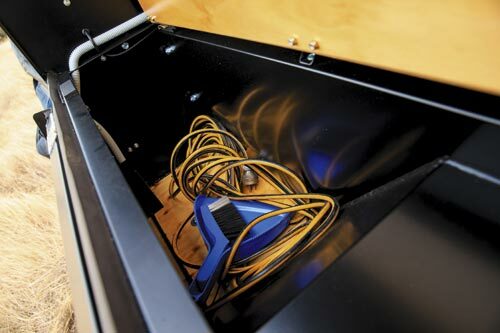 Other handy features include three pockets, vents, 12V power, loops to hang lights, and a seamless sewn-in floor. You can leave most of your sleeping gear on the bed when packing up the bedcase and the bed is a standard height, saving you clambering up and down awkward ladders. There is enough room in the tent for a couple plus one or two stretchers or mobile bunks for the kids. It’s a real treat having the big, comfy king-size bed; a good night’s sleep sets the groundwork for a great holiday. There’s no doubt the Arkaroola’s got a strong offroad chassis. It towed beautifully for our entire trip and its balanced weight distribution walked over the soft sand. The chassis is made from 70x50x3mm and 50x50x3mm SHS hot-dipped galvanised steel and combines with a 70x50x5mm SHS drawbar. It has nine-leaf eye-to-eye offroad springs with rebound helpers supporting a 1500kg, 50x50mm square, solid-beam axle. Our SA Elite demo model was fitted with mechanical override brakes for the hire market but our previous unit had 10in electric brakes. The undercarriage is suitably complete with 16in Mickey Thompson offroad tyres on attractive steel rims. 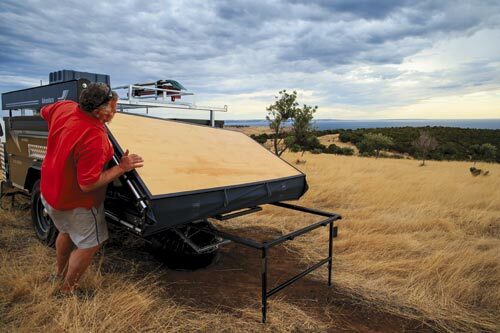 Adventure will powder-coat the Zincanneal panels to match your tow vehicle and supplies a long list of optional equipment, including an alternative stud pattern, electrical accessories and much more. That is the advantage of dealing with a proudly Australian company. 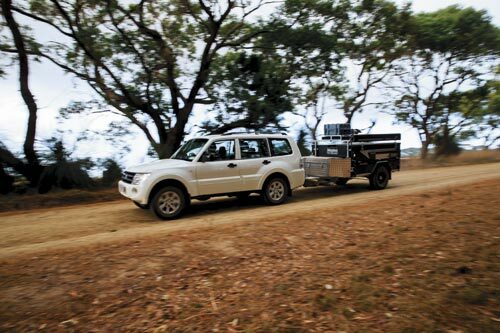 The new Elite package also includes a high-lift jack, shovel, Maxtrax pad and a Projector polycrystalline 120W portable solar array all on individual roof mounts. I have to say I am not a fan of the Custom Adventure StoneGuard. 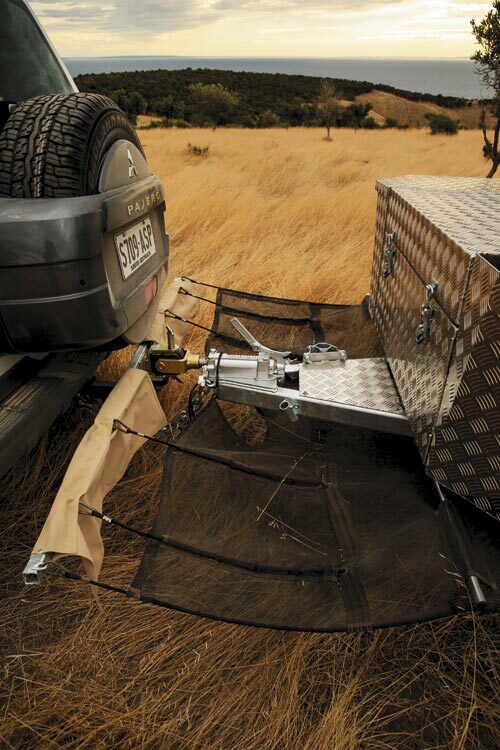 The canvas and mesh assembly requires a support arm fitted to the towing vehicle. It’s secured with elastic bungy cord and encloses the area between the car and the trailer. 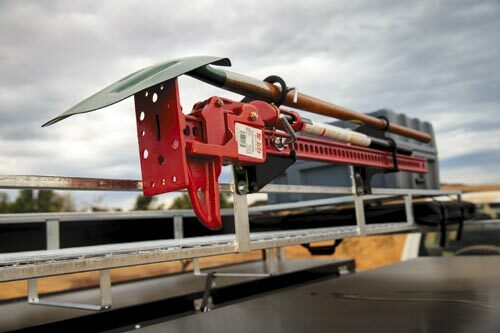 The stoneguard is intended to stop rocks ricocheting from the trailer and through the back window of the towing vehicle. The theory is, do you risk breaking a back window or undo a couple of clips as required? I can see the point but for me it’s just a little too tedious. 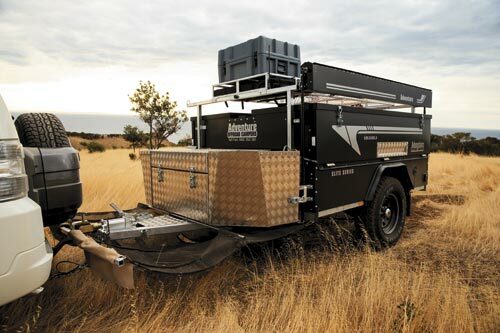 Many Adventure campers are built for the demanding hire market across Australia. 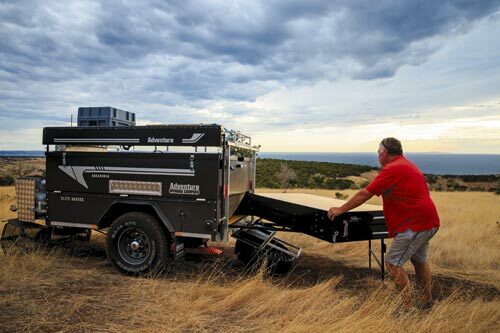 If there are faults or obstacles in the trailer design this market will find them, yet Adventure Offroad Campers has enjoyed a successful reputation for 19 years. 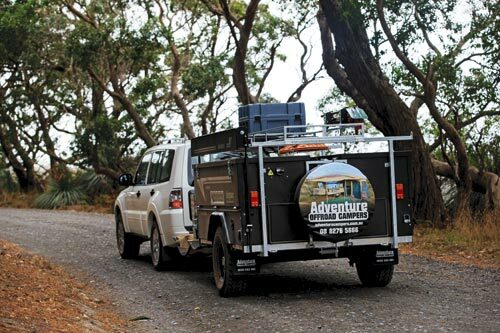 Adventure claims to sell its trailers after three years of hire for around 80 per cent of their replacement value. That is a real tribute to any product, let alone one dedicated to the rigours of the Australian outback. 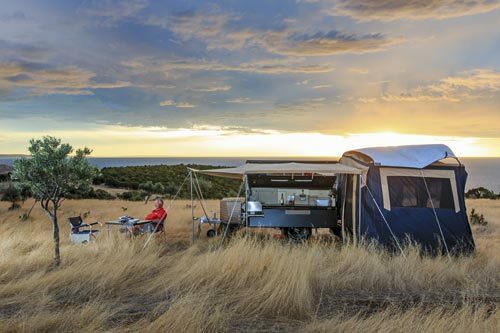 The Arkaroola Elite survived a night of 55-knot winds during our extensive test on the bald hills of Cape Jervis above the Backstairs package. For the uninitiated, that is a 10/12 on the Beaufort scale equal to a gale-force storm and not far from a hurricane rating. The Arkaroola barely flinched. Originally published in Camper Trailer Australia #65, May/June 2013.